Gulab Jamun is one of the popular Indian sweets made of Khoya or Mava. 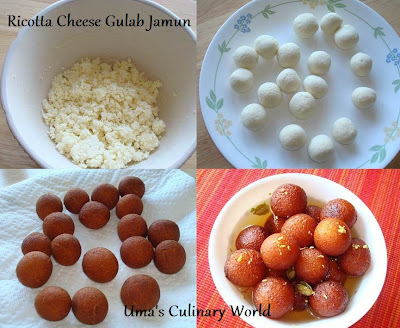 Till date, I used to prepare Gulab Jamun using milk powder, as Mava is not easily available here. Recently, I started using Ricotta Cheese as an alternative to Mava for Mithai like Kalakand and Rasmalai. Today I tried this Italian Cheese for our desi Gulab Jamun and it turned out excellent. Crush cardamom seeds and saffron in a mortar pestle to a fine powder. Heat sugar and water in a vessel. Bring it to a boil. Cook at low flame until the sugar syrups turns sticky (one thread consistency). When you touch the sticky syrup, you can see a single thread forming between your thumb and index finger. Add saffron, cardamom and lemon juice. You can add the skin of cardamom pods to the syrup as well. Lemon juice will stop the sugar from recrystallizing after cooling. Save the sugar syrup for later. In a microwave safe bowl, add ricotta cheese. Microwave the cheese for 7 minutes until it turns granular and moisture is lost. Stop the microwave and check after every minute to avoid burning. Alternatively, you can cook ricotta cheese in a thick bottom pan on a stove top as well. Let the ricotta cheese cool completely. Add all purpose flour and baking soda. Mix all the ingredients well and knead to form a soft dough. Divide the dough into 20 parts. Grease your palms with oil or ghee and roll each one between your palms to form a smooth round ball. I have used Full Fat / Whole Milk Ricotta Cheese. More fat content makes the jamuns softer. Heat oil or ghee/clarified butter for deep frying. Add a small dough ball and see how slow or fast it rises in oil. The ball must take about 5 seconds to float on top of oil. You need medium hot oil for this slow frying process. Add one dough ball for frying. If it breaks, add little all purpose flour. But, too much flour will make the jamuns hard. Deep fry the dough balls in batches until golden brown. Let these fried dough balls/Jamuns cool down. Heat the sugar syrup once again. Do not let the sugar syrup thicken. Turn off the heat and add the fried jamuns. Set it aside for about 2 hours (at room temperature) so that the jamuns absorb the sugar syrup well. Garnish with chopped nuts and enjoy warm or chilled Ricotta Gulab Jamun with ice cream. Lovely and definitely a interesting twist to usual jamuns. very innovative idea to use ricotta cheese for jamuns!! I have a 32 oz tub of ricotta cheese. I was wondering if I'll need to add a little more flour to it? Say around 4 tbsp? For 15 oz, as mentioned above, I added 2.5 tbsp. For 32 oz of ricotta, 4 - 5 tbsp sounds about right.